Delight in a special exploration of Italy’s southern climes, from striking Sicily and the breathtaking Amalfi Coast to unheralded Apulia, the alluring “boot heel” where a vivid history, unique architecture, and bountiful plains join the sun and sea in creating a prized (and crowd-free) region. Add Italian hospitality, outstanding cuisine, and notable lodgings for la dolce vita, small-group style. Single travelers please add $995 Nov; $1,295 Oct; $1,495 Sep. Your $375 deposit is fully refundable up to 95 days prior to departure. All 2019 tour prices above (excluding airline taxes, surcharges, and fees) are guaranteed. 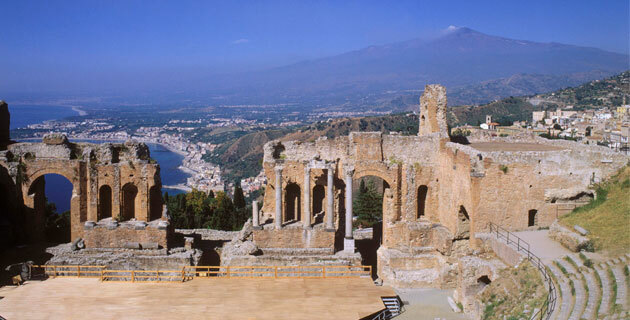 The Eurostars Monte Tauro enjoys an incredible location in Taormina. The hotel cascades down a hillside at the edge of the town’s center, offering an easy walk to many shops and restaurants and also an unspoiled view across the sparkling Ionian Sea. Amenities of this 98-room hotel include a restaurant and bar overlooking the water; outdoor swimming pool with water views, hydro-massage jets, and a lounge area; spa services; laundry and dry-cleaning services (for a fee); and complimentary Wi-Fi internet access. Each air-conditioned guest room has a private deck overlooking the water and features private bath with hair dryer, minibar, in-room safe, TV, and phone. This 32-room hostelry recalls millennia of cave dwellings – but with contemporary comforts and modern amenities. Passageways cut into the rock, external staircases, and elevators connect all four levels of the hotel. 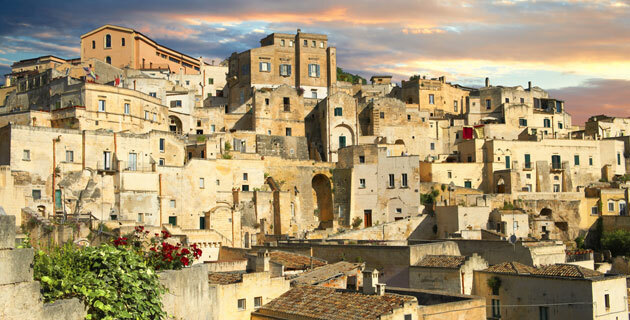 This hotel is in the heart of Matera’s Sassi historical district, close to the city center. The hotel has a bar; air-conditioned guest rooms have private bath with hair dryer, Internet access, and TV. Please note that because of the unique nature of the hotel, room sizes and views vary. A former palazzo, the Patria Palace Hotel is superbly located in the heart of Lecce’s historical center, opposite Santa Croce Basilica. The 63-room hotel boasts many of its original flourishes, though it has been artfully refurbished in an art deco style with Lecce stone and original frescoes. Hotel amenities include a restaurant and bar, solarium, and Internet access. Individually-styled guest rooms with decorative paintings have private bath with hair dryer, air conditioning, in-room safe, TV, and phone. This historic hotel sits in the heart of Sorrento on Piazza Tasso, the main square, close to shops and restaurants. Amenities of the intimate 53-room hotel include an outdoor swimming pool, solarium, lovely gardens with a citrus grove (which supplies all of the oranges and lemons used by the hotel), lobby bar, outdoor snack bar, and breakfast room. Art nouveau-style guest rooms have private bath, in-room safe, mini-bar, Internet access, TV, and phone. Air conditioning is available from May through October; heat from November through April. A well-located hotel just a two-minute walk from the Via Veneto, the 110-room Empire Palace is an actual palace, built in 1870 and completely refurbished and converted to a hotel that offers a restaurant and bar, fitness center, Internet access, and laundry service. Air-conditioned rooms feature private bath with hair dryer, in-room safe, mini-bar, TV, and phone. Please note that because of the unique nature of this hotel, room sizes vary. Explore the Eternal City at your leisure. Extension not available on May 9 departure. Desmond Seward takes in the landscapes, cave towns, frescoed churches, Romanesque cathedrals and Gothic castles of Apulia in this history, the second book in the Armchair Traveller’s History series. Combining interviews, research and essays on Sicilian history and culture, this vivid report by journalist Robb is a superb introduction to Italy’s glorious, corrupt and troubled south. This attractive, visual guidebook features photographs, maps and information on history, culture and nature. 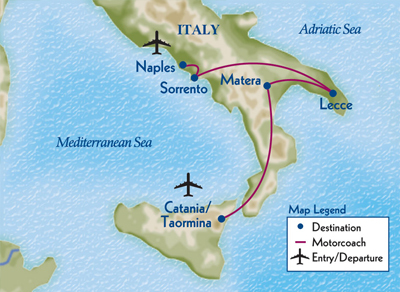 Includes Puglia, Basilicata, Campania and Calabria, along with excursions to Sicily and Sardinia. A detailed map of Sicily (1:200,000) printed on water- and tear-resistant paper. This superb guide to Sicily features color photography, dozens of excellent local maps and a synopsis of the island’s attractions. Handsome, convenient and up-to-date, this is the guide to carry. A handy, palm-size guide to pronunciation, basic grammar and essential vocabulary for the traveler. The second edition of Morelli’s expert survey of Italian handcraft shops and products from Murano glass to ceramics, jewelry and leather. A tribute to the hospitality of Puglia featuring its history, design and style in beautiful photographs and informative text. In a sleek, modern design featuring stunning photography, this cookbook features 80 authentic Pugliese recipes such as kingfish crudo with fresh fava beans, Caciocavallo and scampi with fresh chicory and pomegranate. Astarita captures the fanfare, rivalry and changing fortunes of Sicily from antiquity through Norman, Spanish and Bourbon rule to unification and the 20th century. An old-fashioned memoir of life at Casa Cuseni, the pensione and garden in Taormina run by the indomitable Daphne Phelps, which has been a sanctuary for such guests as Tennessee Williams, Betrand Russell and others, famous and infamous, since 1947. Harrison’s affectionate memoir takes us on the bumpy ride from Australia to Southern Italy, where he reunites with the love of his life, Daniela, while also facing the often-hilarious challenges of life in an eccentric village in Puglia. Inebriated with the sounds of Italian, lovesick for its phrases and enamored of its earthy idioms, Hales, “a sensible woman of sturdy Polish stock,” dives into the Italian of the piazza, literature, movies and streets in this charming memoir. A classic book by one of the 20th century’s great travel writers. Naples ’44 is funny, moving and ultimately a meditation on war and the indomitable character of the Italian people. Hazzard’s lyrical collection of essays on the history, beauty, complexities and contradictions of Naples. Includes a celebrated New Yorker essay by husband Francis Steegmuller. The first of Camilleri’s wildly popular Inspector Montalbano mysteries, nicely translated and shot through (pun intended) with not just memorable characters but also with Sicilian lore and politics. This literary companion and anthology features a who’s who of contemporary Italian writers who capture the spirit, history and allure of the country. Evoking a lost world of privilege and tradition, Giuseppe Di Lampedusa’s memorable tale, set on a rural Sicilian estate during the days of independence, follows the world-weary Don Fabrizio, Prince of Salina. A classic, now in a 50th anniversary edition.